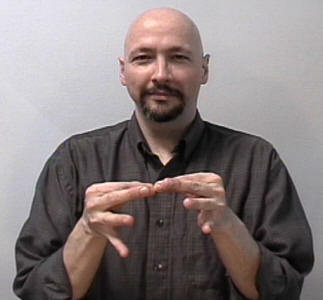 The sign for "LANGUAGE" often shows up as two "L" hands starting together and moving outward. 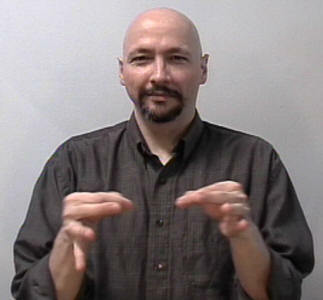 In the old days the sign for LANGUAGE was done the same way as the sign for SENTENCE. Then it was initialized with "L"-hands. And now it seems that the "classic" or legacy version is making somewhat of a comeback. As of this update (2012) I've seen the non-initialized version of "LANGUAGE" showing up in several blogs and on the hands of quite a few d/Deaf leaders. Will it stick? Will the non-initialized version spread? Time will tell. Currently I still use the "L"-hand version since it provides a useful distinction between the words "sentence" and "language." In 2010 I noticed in a vlog (video blog) where a Deaf leader actually signed both versions. She used the non-initialized (trendy, new) version at the beginning of her presentation (when she was consciously thinking about it), Then later during her presentation she subconsciously switched back to the familiar "L"-hand version. Why do I point this out? Because I want you to know that sign language evolves and changes. In the example above we see a person actively striving to incorporate an emerging (or re-emerging actually) signing trend into her presentation. Thus the language choices of your peers will influence your own language usage. Version 1: As in a group of words that expresses a thought. Or as in a spoken or signed language. 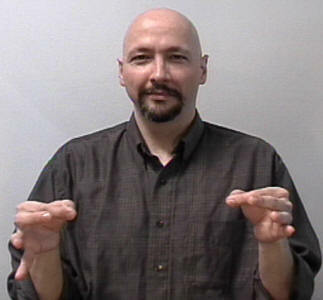 To do this sign, hold your "F" hands together and pull them apart. Use a slight twisting/shaking movement of the forearms as you pull the "F"-hands apart. Do it the same way as above but do it with "L" handshapes. Often I see ASL students signing: "I'm learning sign language," and they unnecessarily add the sign LANGUAGE to their sentence. They could instead just sign: "I LEARN SIGN." Or, "I LEARN LEARN SIGN." -- The second "LEARN" shows helps indicate more of a process rather than a completed event, that is: "learning" vs "learned." Anyway, my point is that you don't need to add the sign "LANGUAGE" because when you state that you are learning "SIGN" it means "sign language." Comparison, you wouldn't say, "I eat food with my mouth." No, really? I thought you slid a tube down your nose. Okay, okay, -- a better comparison: You wouldn't (shouldn't) say, "I speak English language." Instead you should just say, "I speak English." Everyone knows what you mean. If you add, "language" at the end of your sentence it basically means that you are a poor speaker of English because a native would know that English "is" a language and you don't need to add the word "language" to that sentence.